Another Major Stock Market Top at Hand? Last week, I suggested that there would be a major top around the 22nd. That top proved to be January 18 right on the quadruple and powerful Bradley turn, as well as the Venus/Mars trine. That same weekend we had Mars square Saturn. 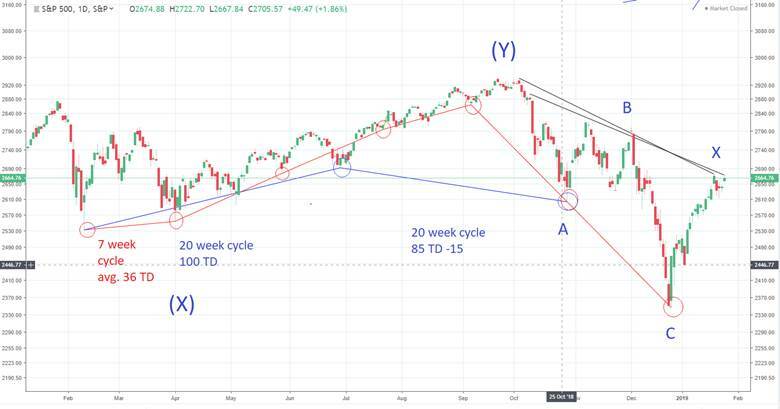 On January 25th we had another Mars trine with Jupiter and the SPX appeared to make a failing ‘b’ wave top with only the Dow Industrials making a new high. Coming out of a rising wedge and making a double top is serious business, especially when you have P/C ratios as low as they are now and the fear has just about left the building. What I’m talking about is another drop coming like we had from October 3 to the December 24/26 bottom. When I saw the shallow move down last week and the resulting attempt at new highs I knew the market was in trouble. Another thing I observed this week was President Trump asking his staff what important services would be affected if the government were shut down into April. He then suggested that the three week reprieve into February 15th would only last three weeks in which time he may enact his authority to create a national emergency. That got me to thinking. I went back to the drawing board as far as the 7 and 20-week cycle lows were concerned and realized that the Dec 24/26 low was not a 20-week low, but only a part of a 7-week low sequence. I also looked at the astros to see if they lined up with what I was suspecting and indeed they did. The October 29 low was a 100 TD low minus 15 TD’s, which is max on the 100 TD (20-week) low. The February 9th to June 28th low was exactly 100 TD’s. The chart below looks at the repeating 7-week lows, which tend to run 36 TD’s 3 TD’s. The projection is for another ABC type drop into around April 9/10. This could take the SPX down another 20% top to bottom just like we saw from October 3 to December 24/26. 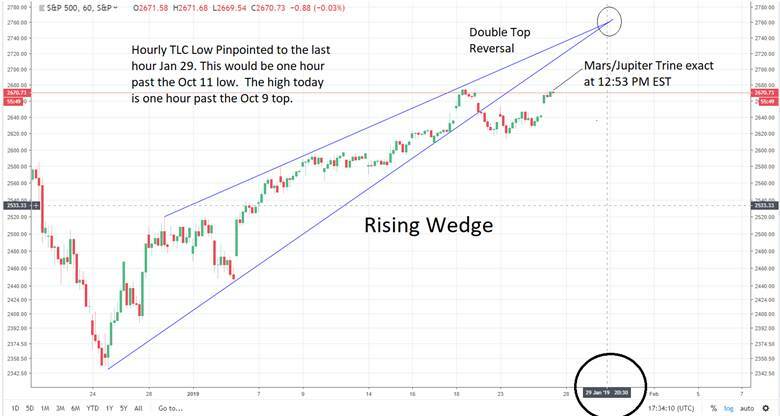 Next week has the TLC (trend line convergence) of the rising wedge late in the day on the 29th (see October 11 for parallel). These converging lines point to an important bottom and that being January 29. From January 29 to the new moon of Feb 4 is exactly what occurred from October 11-16. February 1 has Mars square Pluto (more Mars aspects now especially involving government!) and Venus trine Uranus on Feb 2 indicative of top (February 4). February 4 to Feb 14 (the next 7-week low combined with the 33- week low) equals October 16-29. Mars is heavily aspected throughout here as it is also in its ruling house of Aries until February 14, the day before the supposed three week reprieve. Mars in Aries is also affecting the Buttonwood (stock market) chart January 30-February 13, making for some wild swings coming up. Jupiter in Sagittarius square Neptune Pisces on January 13 has an orb of about three weeks in holding up the stock market (that is today) along with the major Bradley turn and now Mars trine Jupiter and well, watch out next week as we go into a week that Martin Armstrong (Pi Cycle) describes as PANIC!!! The next Gann cycle turn top would be February 27th (a Bradley turn) and we have a Mercury trine the Moon on the 26th (late). Then March 11th low (Gann) up into the next trine (Mars trine Pluto; watch out below just like December 3-24!!) and Gann top on the 20th of March (Bradley turn March 17-18 ). March 6 has the Sun conjunct Neptune in Pisces its (Neptune’s ruling sign) and Mercury turning retrograde on the 7th. This would indicate a turning low and then top (just like Nov 14-15). Down into March 11/13 (Sun square Jupiter in Pisces) then up into the 20/21 then down hard into April 9/10. April 7-11 has another Bradley nesting. Voila!! Expect a huge rally into June (Jupiter square Neptune again) then a low in late July and then a top in late September (the last Jupiter square Neptune) or early October to as high as 3100 SPX, then another even more severe down turn into 2020. We are in the general time frame (through early 2020) for an investor’s nightmare but a trader’s dream. As far as the gold stocks are concerned, we have bottomed on the 23rd as expected and now a rally into February is at hand as noted before. I think an important counter trend rally is about to be completed and we see a large move down into June or July then up strongly into early next year, much like we saw from January 2016 to July/August 2016.